The answers are “Yes”, “Yes”, and “Yes”. Yes, change is a buzz word these days, thanks both to the Obama-for-President campaign and The Great Reboot of 2009, where the reset button was pressed on entire industries. Certainly, the world is changing at an unprecedented pace, right now. But, change is not new and when people think of change, they usually think about adapting to changes occurring around them. That’s being a slave to change. Yes, I am proposing that we, as salespeople and executives, have to change: we must adopt a whole new way of thinking—a change-centric way of thinking that sees change not as something that we must adapt to, but something that we can drive to create new opportunities and growth. Rather than seeing problems and solutions, change-centric salespeople and executives see changes and the forces that are driving them. They harness those forces to create new opportunities and grow their business. In other words, they are change masters. Yes, this also applies to customers. All customers have goals they have not yet achieved. Rather than looking for customers’ problems and pains. Look for the changes that will enable them to achieve their goals. 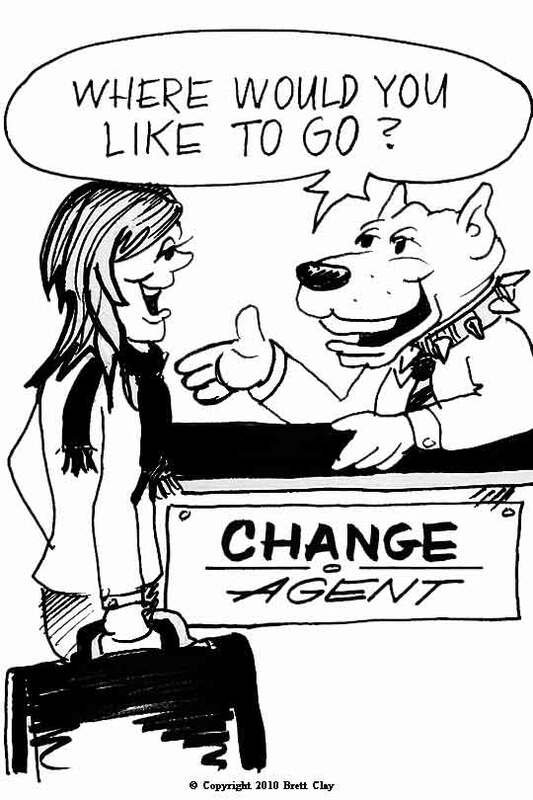 Be a change counselor instead of a solution purveyor and customers will beg you to help them achieve their next goal. Real estate is a great example. As the radio show host noted this morning, the environment for real estate sales professionals is changing dramatically. Real estate agents used to view the Multiple Listings Service, then take their clients around viewing homes and facilitate the transaction once the buyer decided upon a house. Now, buyers can not only view multiple listings on agents’ websites, but they can now tour each house “virtually” with 360 degree photos of each room. Real estate agents are also facing enormous competition for listings, driving brokerage firms to add more and more services that enable homes to virtually sell themselves. So, on one hand, the traditional role of the real estate agent to inform the buyer and transact the purchase is diminishing rapidly. On the other hand, selling and buying a home is one of the biggest changes that people make in their lives. Great real estate agents don’t just facilitate the transaction, they facilitate the client’s journey through these enormous changes. They serve as counselors and project managers who help clients figuratively and literally reach new destinations in their life. When they perform as change agents, real estate professionals create value that will not be replaced by websites any time soon. Those sales people and company executives that execute these three principles will be the winners in the new decade. What is your view? 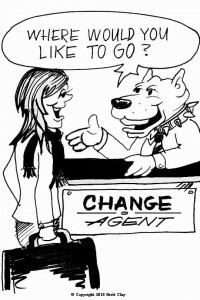 What does “change” mean to you? I like the ideas you share on your blog and in your book. Here is my view on change. The first question is “what drives change?” Ideas, money and technology. The first two are obvious. Internet technology creates new ways of sharing, communicating, collaborating and conducting business. It’s almost like learning a new language that demands a lot of mental agility from those who want to speak it well. Since IT is in constant transition, the economy will be in constant transition and that requires that we give up the idea of pursuing rigid goals, we have to give up rigid business models, we need to embrace new sales processes faster. The economy has become fluid and we have to transition from rigid to fluid. We need to let go of the notion that we will ever get to any fixed point in our lifetime, the best thing we can hope for is to become more agile so we can avoid becoming a victim of change ad become masters at succeesful transitions. Change is like a wave and we need to learn how to surt it.